England flanker Tom Wood is free to play against Australia after he was not cited for the incident which saw Wales full-back Liam Williams knocked unconscious on Saturday. However, Wood has been given a warning after his shin made contact with Williams' head as he tried to secure possession for Wales in the 28-25 win over the hosts at Twickenham. A warning equates to a yellow card. Three yellow cards in the tournament lead to a disciplinary hearing. On Sunday, Wood apologised to Williams with a message on Twitter. Wood wrote: "Really relieved to hear you're back on your feet OK mate. Horrible to see you stretchered off because of me. Hope you have a speedy recovery." Full-back Williams, 24, though, could pay a heavier price for the clash as he can only make a gradual return to play under head injury protocols. These could see him ruled out of Wales' remaining pool matches against Fiji and Australia. 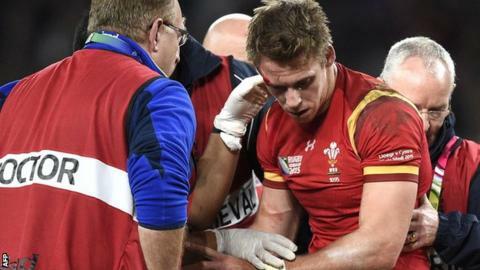 Williams's potential absence adds to Wales's injury problems with centre Scott Williams (leg) and winger Hallam Amos (shoulder) set to be ruled out of the tournament. Wales play Fiji in Cardiff on Thursday, before England host Australia at Twickenham on Saturday.